Sharing Wheels Community Bike Shop has hired our first-ever paid shop manager, Josh Pfister. Josh has been a long-time volunteer with Sharing Wheels, and started working for us this summer as a bike mechanic. 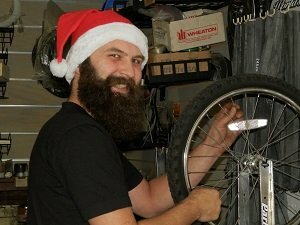 He has worked at the Marysville Bike Shop and at Bicycle Centres in Everett. His preferred mode of transportation is an old Bridgestone set up as a singlespeed. As shop manager, Josh will oversee daily shop operations, ensure quality repairs and outstanding customer service (he’s a very friendly guy), and work with the Board of Directors to promote our shop’s development and growth. Thanks to a head start from volunteers during the United Way Day of Caring in September, Josh has been busy reorganizing the shop. Things look a lot different if you haven’t been by lately! The job is part-time, but has allowed us to open the shop 4 days a week instead of just 3. Our Saturday hours are funded by a grant from the City of Everett. Volunteers continue to be essential part of our nonprofit community bike shop. Stop by to meet Josh and see how you can help.